What are we trying to achieve with our curriculum at Millbrook C P School? At Millbrook, the Essentials Full Spectrum Curriculum written, devised and published by Chris Quigley forms the backbone of our curriculum. This curriculum clearly states the knowledge and understanding to be gained at each stage of a child’s development at our school. In addition, our curriculum and subject leaders map out a clear structure of topics to be followed termly. The curriculum and subject maps for each class can be found below the curriculum tab on this page. At Millbrook we compliment this core curriculum with specific programmes which are tailored to our needs. For example, Ruth Miskin’s Read, Write Inc enables our children to make a strong start to their reading and writing attainment. McGaw and Hill’s Spelling Mastery ensures our children receive a loyal and structured approach to spelling throughout our school. Nelson Grammar is used in Key Stage 2 to ensure a progressive structure and common approach to our grammar teaching. White Rose Planning and Times Tables Rock Stars form the foundations of our Mathematics curriculum. In the next academic year, we are introducing The Power Of Reading to our English Curriculum to embed a love of reading in our children. How is our curriculum delivered at Millbrook C P School? Our curriculum is delivered through exciting, inspirational and creative teaching, ensuring that pupils are fully engaged with their learning and connections are made within and between subjects. We regularly have WOW events to launch specific topics across school. 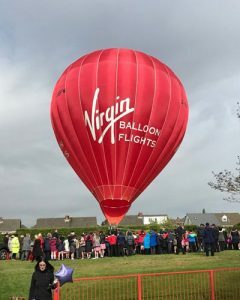 Virgin Balloons brought a hot air balloon to our school and this marked the memorable event that ensured our topic ‘Up, up and away.’ was a great success. A special Mini Police Launch Day, saw the arrival of the Police helicopter which performed a dance for us on our field. 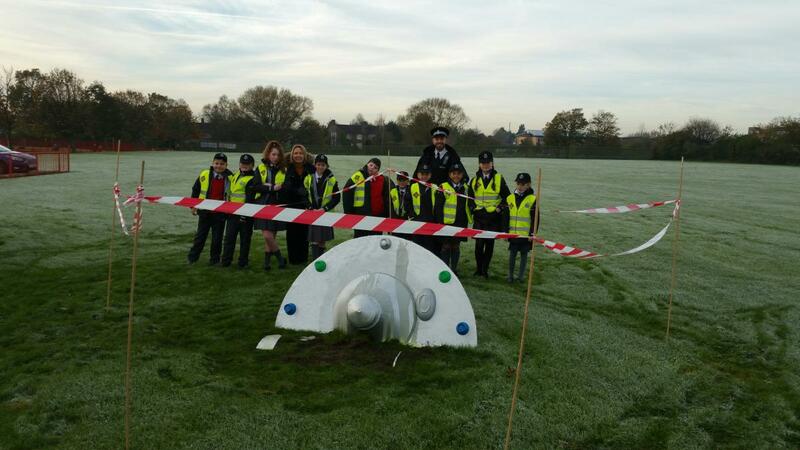 A mystery engulfed the school when an Unidentified Flying Object landed on our school field. English and Maths take place in the mornings along with specific programmes tailored to the needs of our children here at Millbrook. The afternoons are alive with subject and topic work as identified in our curriculum maps. Teachers can choose to block lessons across the afternoons to ensure greatest impact on pupils’ learning. Our curriculum is enriched with visits off site; visitors to school and a widening range of after school clubs. We believe that children need authentic experiences and a rich cultural stock to support their attainment. Educational trips to the vast range of resources on our doorstep here in Kirkby are littered throughout our curriculum. 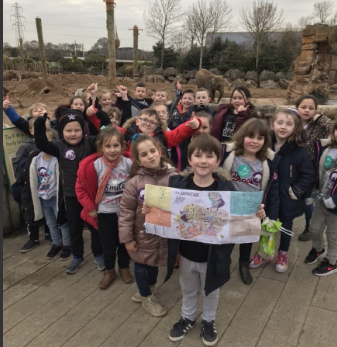 A few of the many highlights for the 2018 have been three workshops from the Safari Rangers at Chester Zoo followed by a day at the zoo for the whole school. This centred around our Science and Geography topic looking at the conservation of Indonesian Songbirds. Year 6 visited the theatre to see a local production of Her Benny. Class 8 brought the museum to school following a visit to Prescot Museum they returned with a mini museum which children used to showcase their own work. What difference is our curriculum making to the pupils’ learning? Our end of key stage data continues to demonstrate good attainment and progress across school. Assessment of our wider curriculum in July 2018 showed that children are both knowing more and remembering more across most subjects. A large majority of children demonstrate the knowledge and understanding we would expect for their stage of development. Any gaps in the children’s current knowledge has been identified and this has informed our curriculum content for the academic year 2018 to 2019. Curriculum and subject leaders will ensure training and resources enable children and teachers to continue to improve the impact of our curriculum. You can find our curriculum milestones on the curriculum tab above.